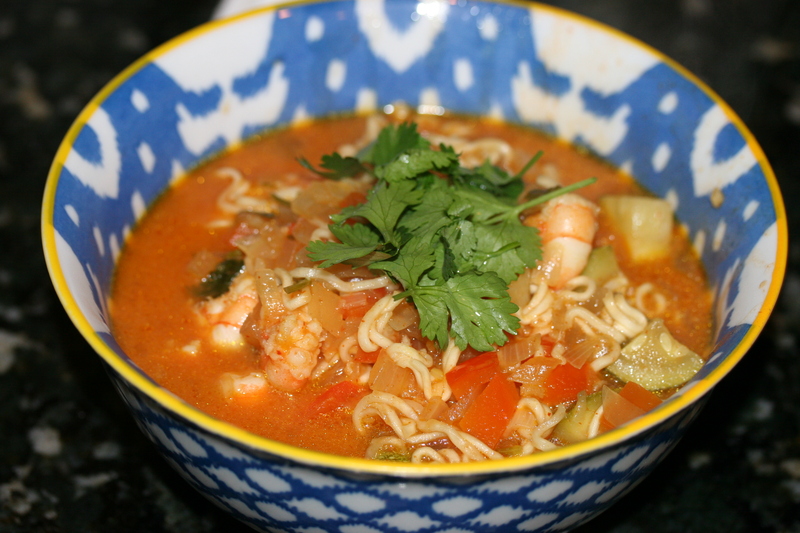 Jill caught a cold the other week and was all stuffed up with a sore throat etc… She likes shrimp so I decided to whip up a really spicy warm bowl of soup to sooth her throat and open her up. 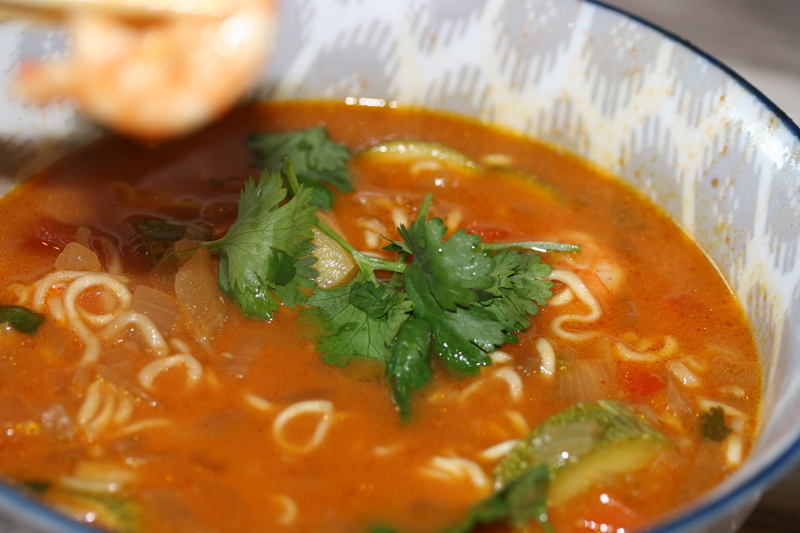 So I decided on a ramen based Thai soup where I could kick up the curry and Sriracha to do the trick. I found a soup on Damn Delicious and decided to use that as my base recipe. Chungha’s blog is great with simple ingredients and great photography. She is worth a click to check out. 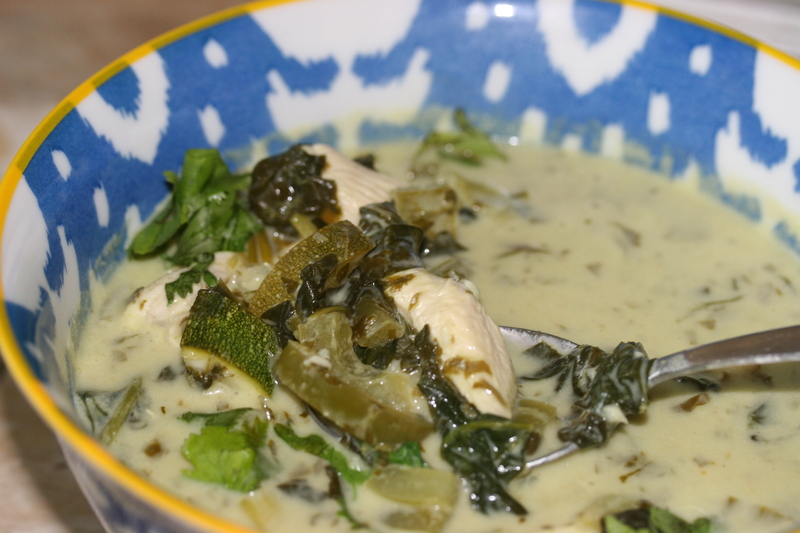 This soup really turned out perfectly. The balance of heat with the subtle smoothness of the coconut milk made for the perfect base. 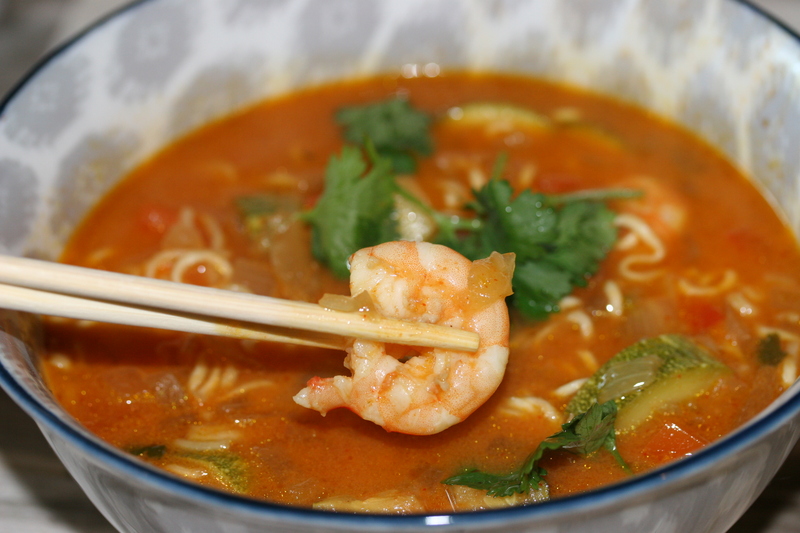 If you don’t enjoy curry or even shrimp you could still make this and sub in some tomato paste and another protein. 1. In a pot on medium heat add your butter, onion and red pepper and saute until tender. Add your garlic and ginger, stir for one minute. Add your coconut milk, stock, fish sauce, red curry paste, sriracha. Bring to a simmer and taste. Adjust seasoning accordingly. 2. 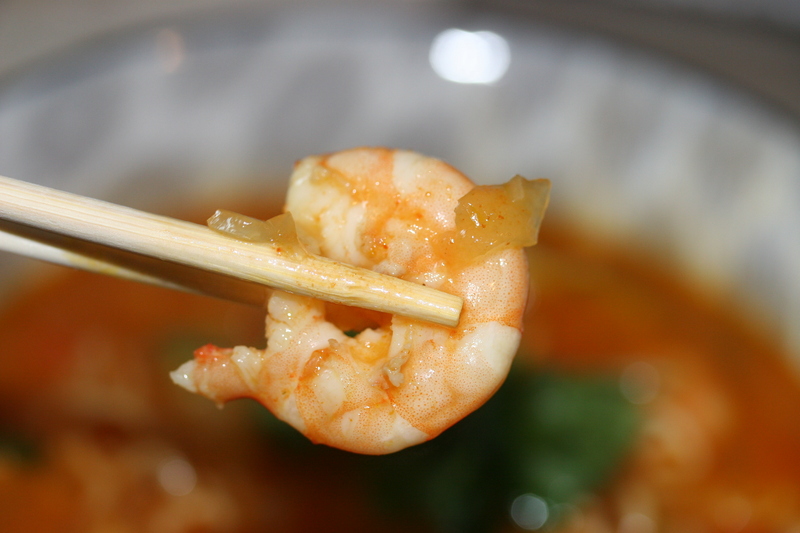 Right before you are ready to serve it add your shrimp and ramen. This will cook really quickly, like 3 minutes quick. Remove from heat and serve with cilantro. Sometimes I feel like just jamming a bunch of vegetables down to make up for poor food choices. Jill was gone this evening so I decided curry. Over the weekend we went with some friends to a place called FT 33. It’s touted as one of the hottest restaurants in Dallas given its attention to local and farm to table. It’s one of those places that sits on the edge of snobby but worth the occasional splurge. Jill and I ordered their charcuterie board that had many smoked and aged meats along with pickled beets, green beans etc.. If you ignore the snob and admire the craft you can tell they put a ton of effort in that little bit of food. I ordered chicken thighs in this coconut milk green sauce. It was super complex. I kept an eye on the kitchen and could see them pulling out all sorts of containers that each required countless hours to achieve a specific taste. A true recipe of thoughtful constructed flavors and textures. For that I give them huge kudos but the price for that level of effort can be steep for most of us. All that to say, the sauce stuck in my head. 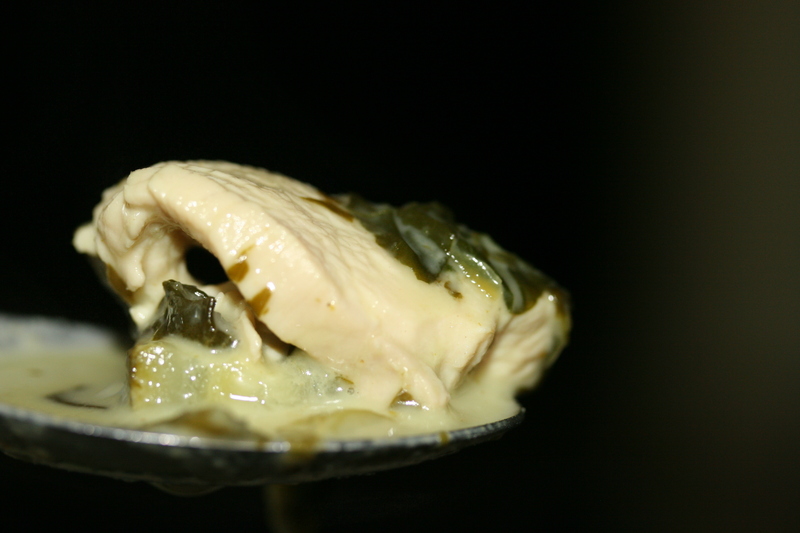 I could see it was a blend of a coconut sauce and some green oils. 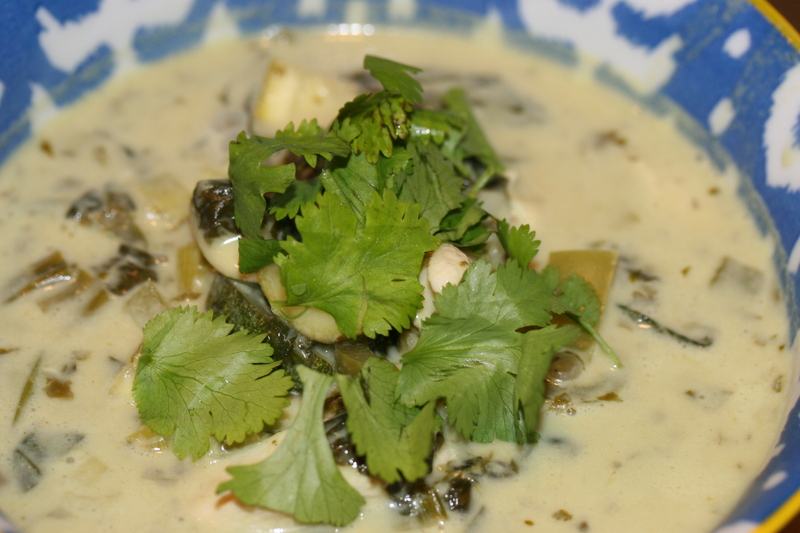 So tonight in honor of that sauce I decided to use coconut milk, green curry and a ton of vegetables. Not nearly as complicated as FT33 but given the time I spent this dish was perfection. I will attempt to remember how I constructed it. 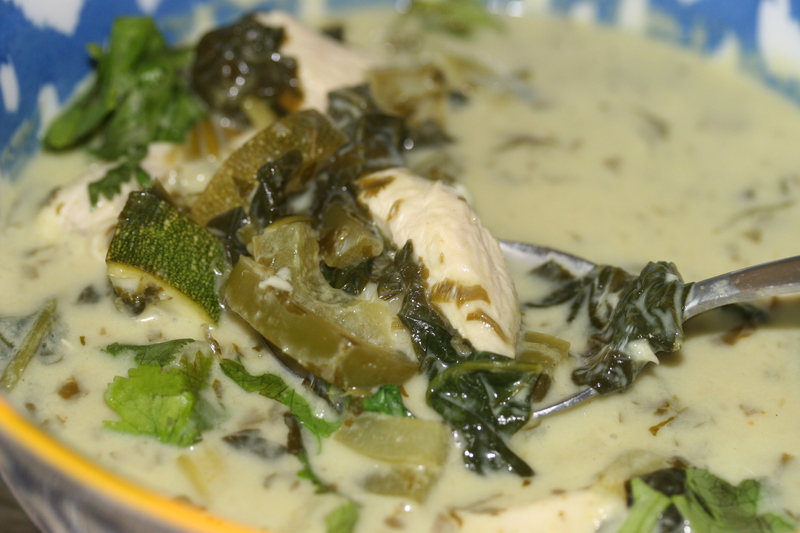 Ive said it before but if you haven’t had green curry please try it. It’s just so darn delicious. 1. 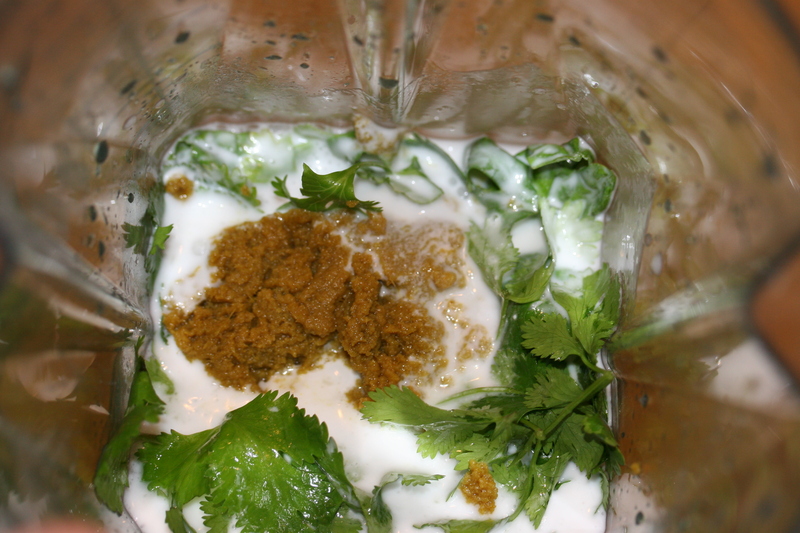 I took the basil, cilantro, garlic and coconut milk in a blender and blended it smoothly. 2. I took a pan on medium low heat and added the mixture to it. I cut up the chicken, the peppers, onions and zucchini and added them to the pot. I also added the cumin an salt. I let that simmer for about 20 minutes. 3. Right before serving I added the spinach and cilantro. Soooooo good sooooo easy soooo green. 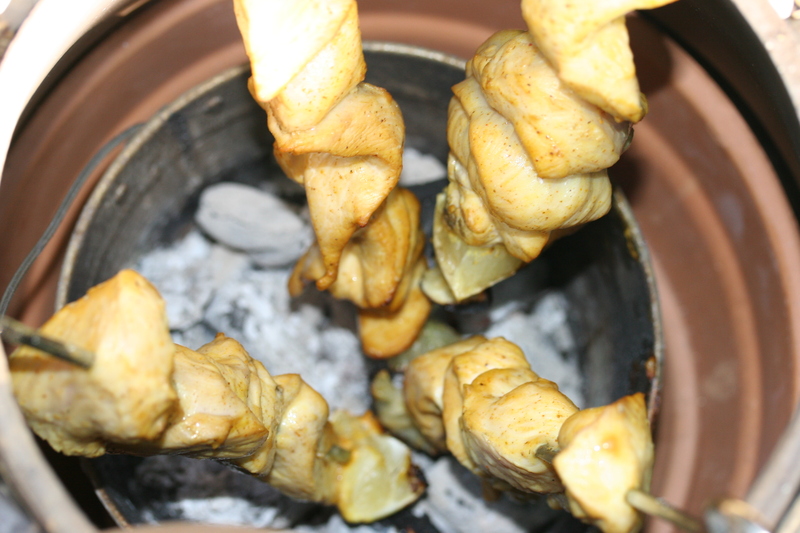 I’ve only used my homemade tandoor oven once so felt the need to tempt the bumper crop of mosquitoes with my sugary blood and fire it up for some Thai chicken satay. Each week I have to devote one dinner to get my fill of Indian, Thai or Korean food. Since the Tandoor needs a skewered meat, I settled on a chicken satay with spicy peanut sauce, cucumbers and smashed potatoes with Za’tar seasoning. For the tandoor I bought some “long as your leg” skewers that don’t quite work elegantly with my oven so I am excited to try a new technique of hanging the skewers vertically. That puppy is getting up to 700 degrees hot which is in green egg territory but cost me only about 60 bucks to make. Man fire meat beer whiskey….oh an Thai food with 300 of your closest blood sucking friend. 2. Cut your chicken into bite sized pieces and add them to the marinade and let it do it’s work for at least 2 hours and better yet overnight. 3. 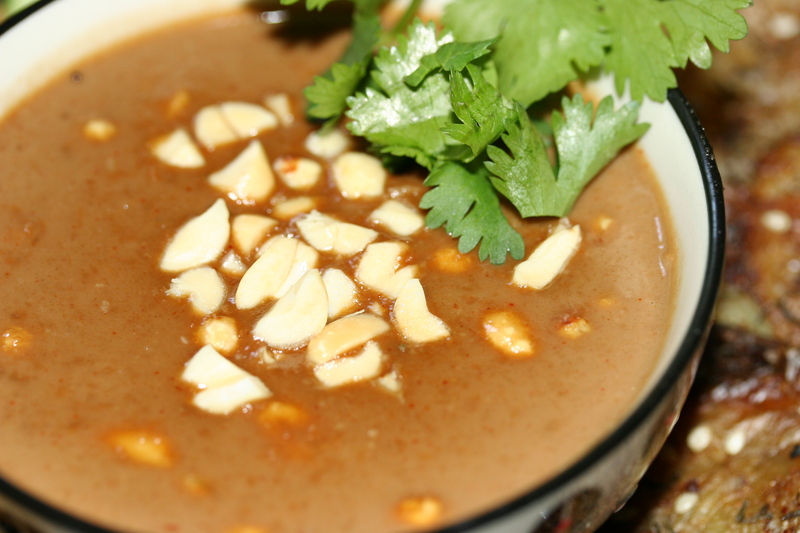 Make your peanut sauce by adding all the ingredients except for the peanuts and cook in sauce pan until smooth and thickened. Ten minutes should do it and keep the temp on low. Let it cool and then add the crushed peanuts . 5. 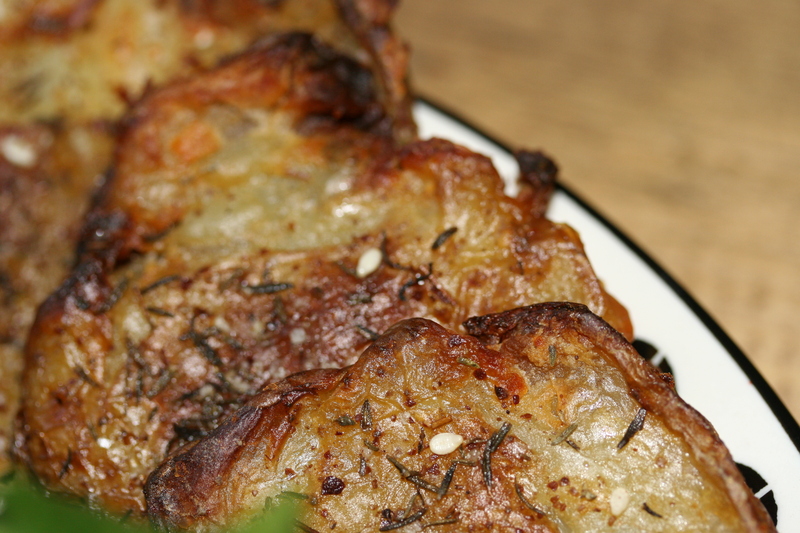 Serve with your side of sauce and cucumbers and your potatoes. Enjoy with your favorite beer or whiskey. BTW had a Flagstaff beer out of NY the other night. It’s a great lager with a nice pungent finish similar to Heineken. I’ve posted a few PF Chang copycat attempts. 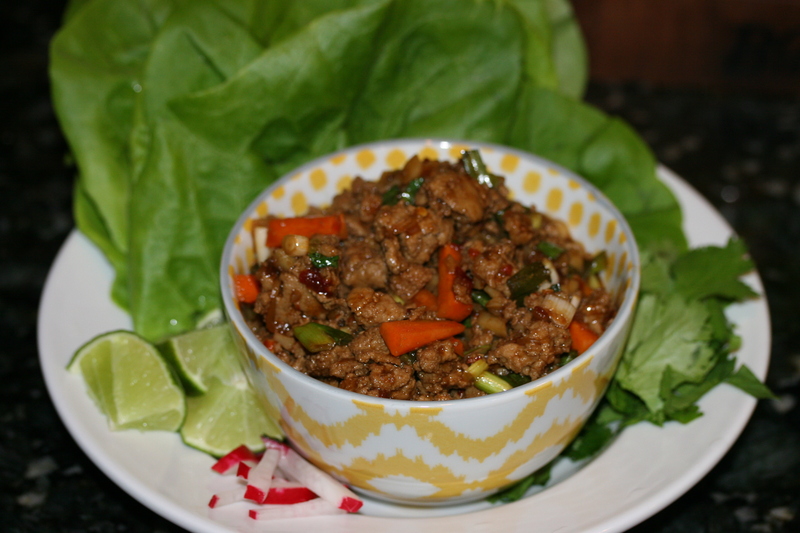 Now when I make lettuce wraps I am not sure what I am making.. a mash up Korean, Chinese or Thai. I love playing around with Asian sauces. 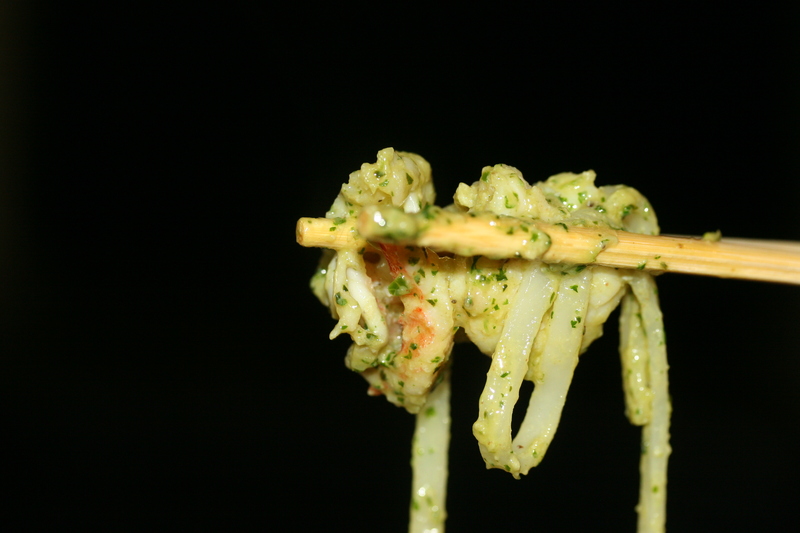 The balance of sweet, salty and spicy just scratch me where I itch. Fairly healthy meal or snack. I would say great for parties but we seem to make a mess and have sauces pouring down our hands. So bring your napkins. 1. Brown your meat (medium heat) and remove any of the fat. 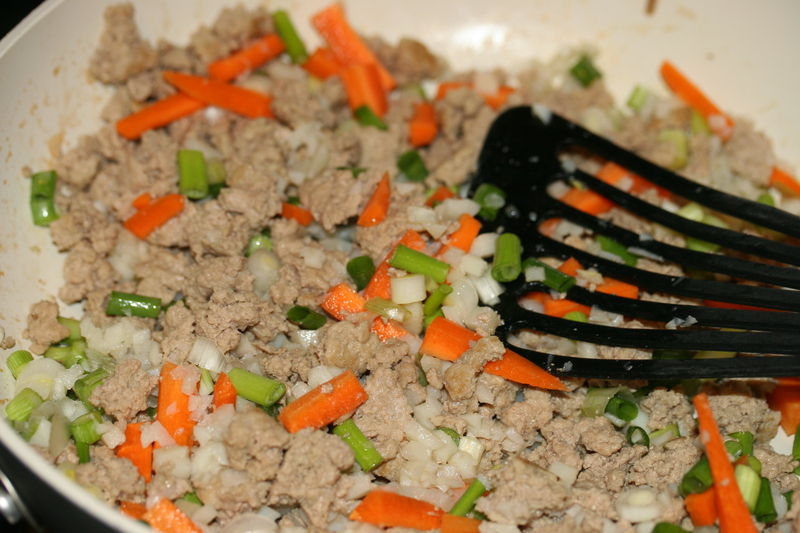 Remove your turkey from the pan and add the white parts of the green onion. Let them soften a bit. 2. Now return your meat to the pan along with the onions, garlic, carrots, water chestnuts and ginger. 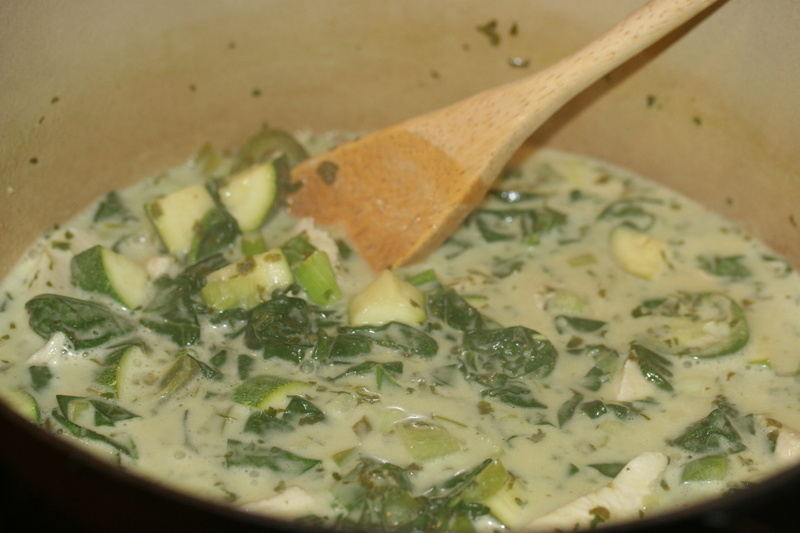 Then combine all the wet sauce ingredients and stir until simmering and until it thickens or reduces a bit. Add the cilantro right near the end. Remove from heat to let cool a little bit. Remember you will be eating this with only a piece of lettuce to shield your hand. 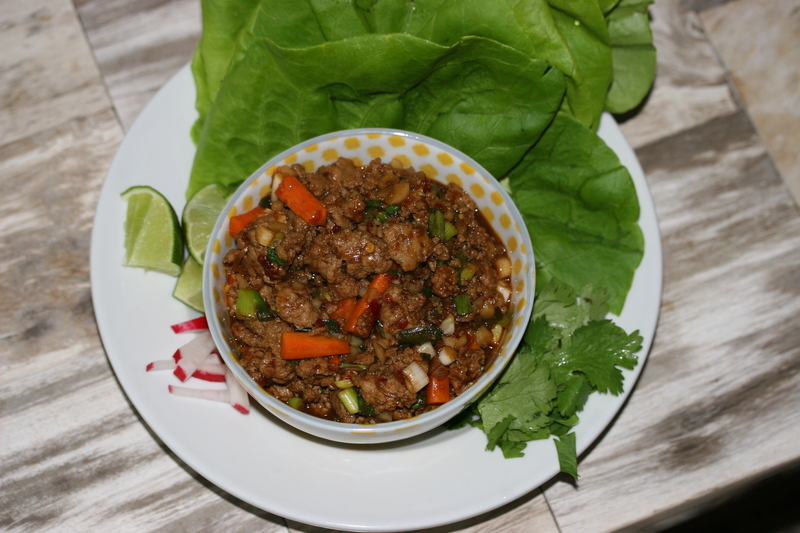 Serve with some diced radishes, cilantro or peanuts. As I have mentioned before I read food magazines, cook books, blogs for inspiration and ideas. I gotta say Rachael Ray continues to surprise me with her recipes and ideas. 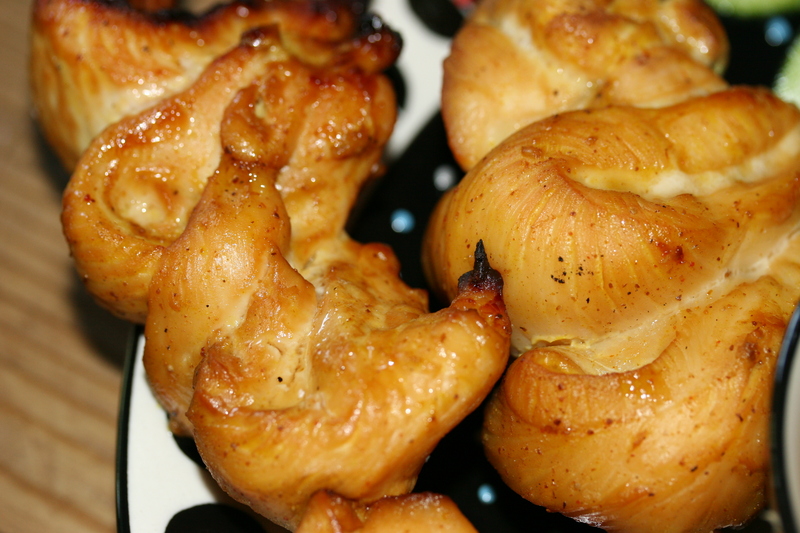 They are often super easy but deliver on flavor as if they are twice as complicated. She can be campy and I don’t really watch her shows but I do subscribe to her magazine. First off, I am not a huge shrimp fan but I saw this dish in her magazine that caught my eye. It wasn’t the picture or the title but one of ingredients. Peanut butter. 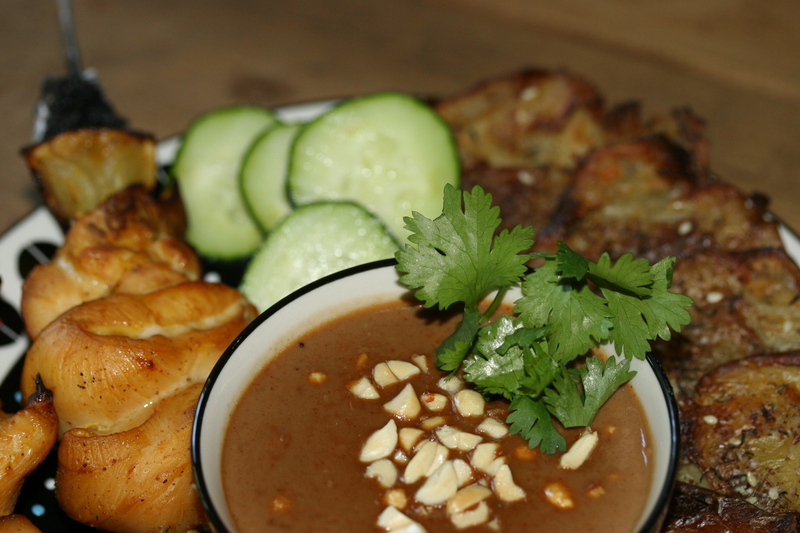 I make this peanut thai chicken or turkey dish that I just love and it uses peanut butter paired with vinegars, soy and Sriracha. Jill likes noodle dishes and given it’s rice noodles and GF, I knew she would dig it too. This dish was pretty darn good. It just works so perfectly together. 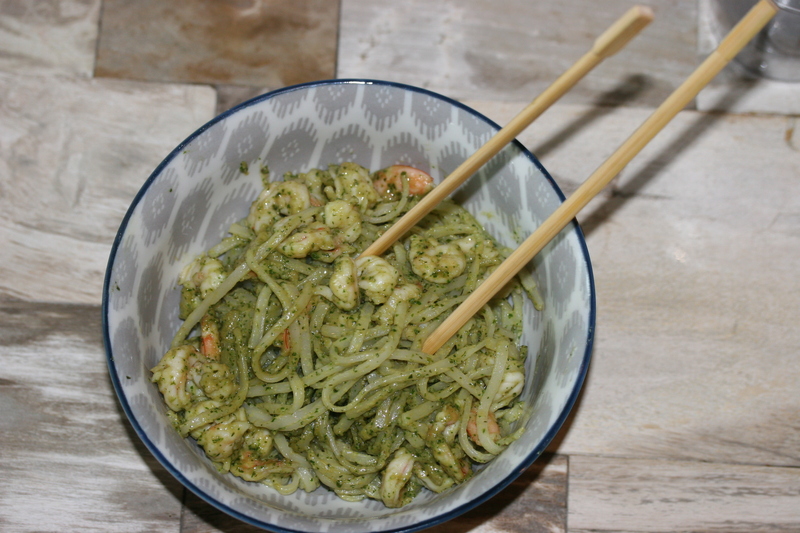 Sweet from the peanut butter, fresh from the basil and cilantro, spice from Sriracha and then the texture of those noodles and shrimp. Comfort in a bowl. For those cooking for kiddos or boring palate friends/family/mates this could be a good one to use. You could sub chicken for shrimp but try not too unless you just hate shrimp. If you mildly like it, stay with it. One note, I bought a bag of chopped kale and brussels sprouts to add but forgot it. I think it would be a great addition for more crunch. RR used iceberg lettuce in hers. Reserve some noodle water in case you need to thin it out. 1. 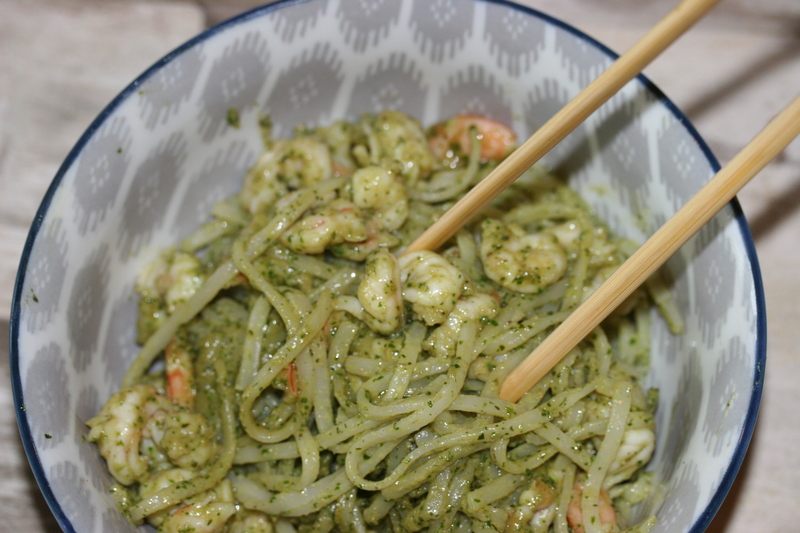 Three basic steps..noodles, pesto and shrimp. 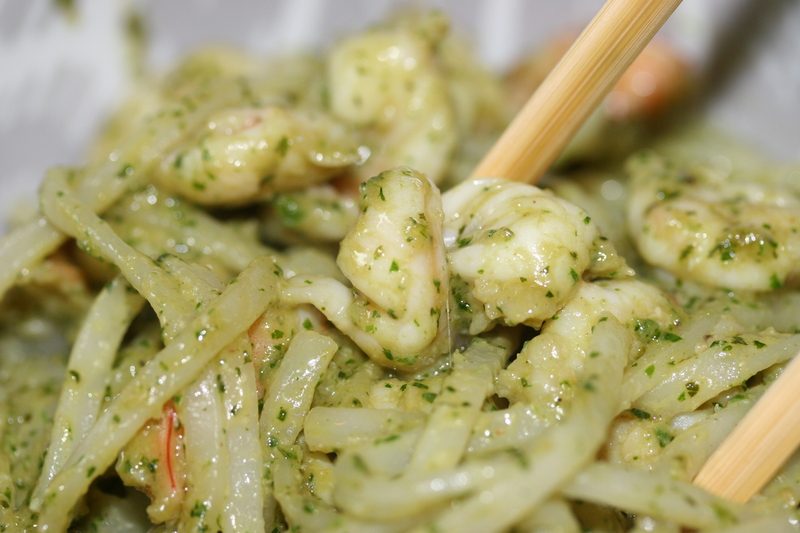 Clean and peel your shrimp. Cut into two pieces vertically. 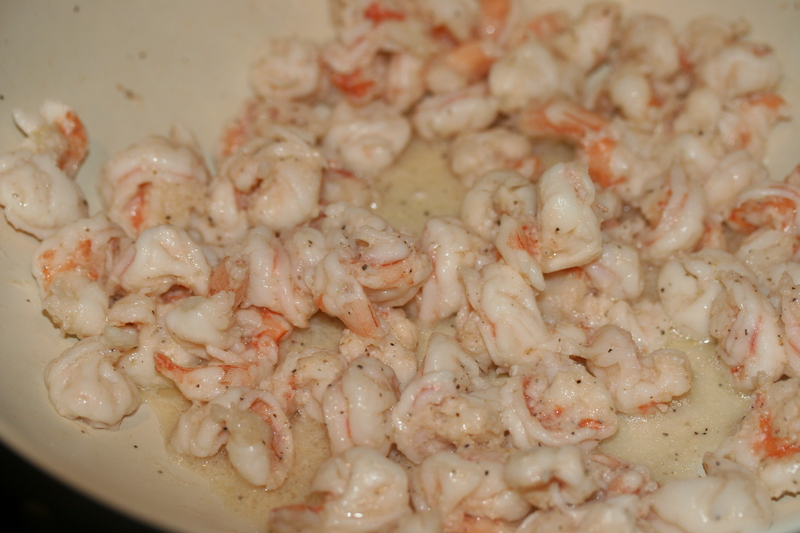 Wash them and then add them to a medium heated skillet with a few splashes of fish sauce. They will turn pink and will curl up. They look ugly I know. Set aside to cool. 2. 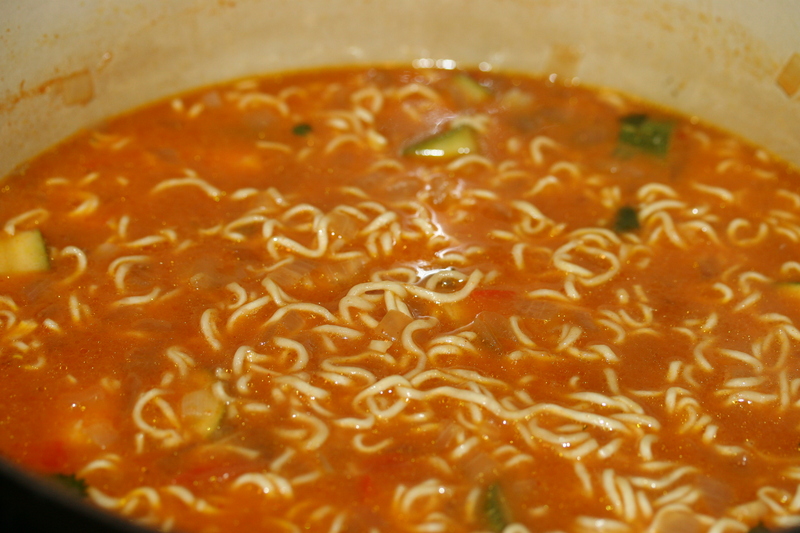 Cook your noodles according to the package and then wash them in cold water. Don’t forget to reserve some pasta water in case you need to thin out your sauce. 3. 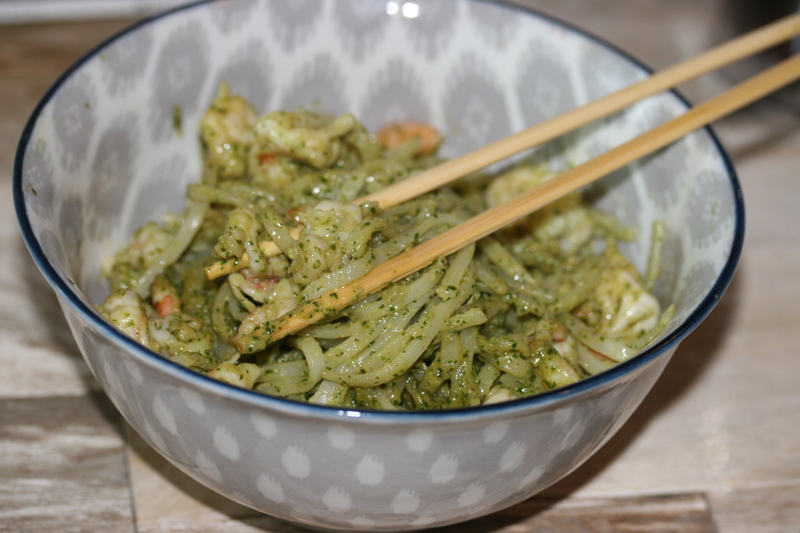 For the pesto add the herbs and fresh ingredients in a food processor and pulse until smooth. Add the peanut butter and then while the food processor is on slowly add your wet ingredients until smooth. 4. To assemble put it all in a low heated pot and stir until coated well. Right before serving if you want to add your lettuce or kale stir it in and serve immediately. It will wilt but you want it fresh as possible. Thai food is right up there at the top of my list of favorite foods. 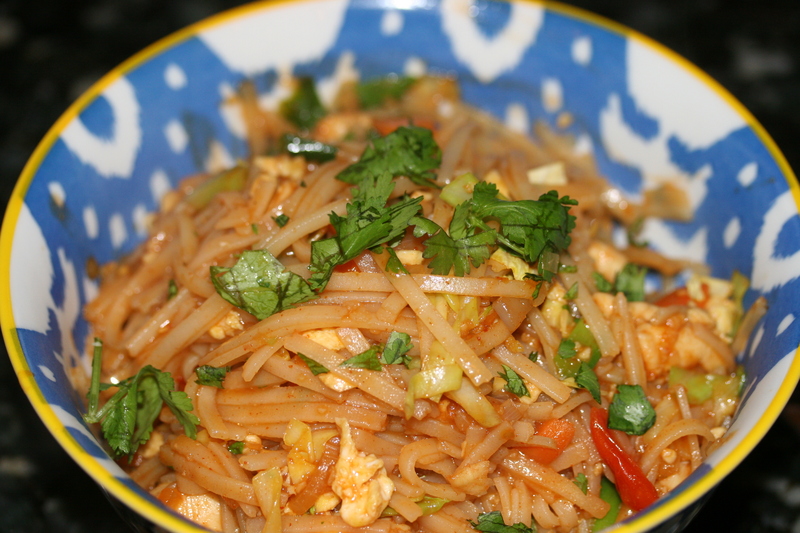 While I like various curries, noodle and rice dishes, it seems like Pad Thai hits all my favorite Asian/Eastern flavor profiles…spicy, salty with a little sweet. 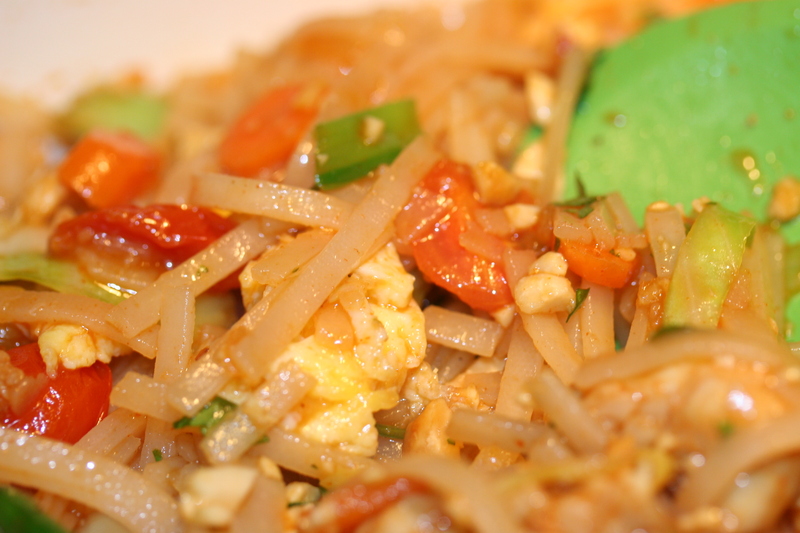 For some reason I also love the tacky texture of rice noodles and how they soak up the flavors of the dish. The only challenge is the speed at which everything cooks. It’s not a fix it and forget experience. You best have everything chopped and ready to go and work according to how things cook. 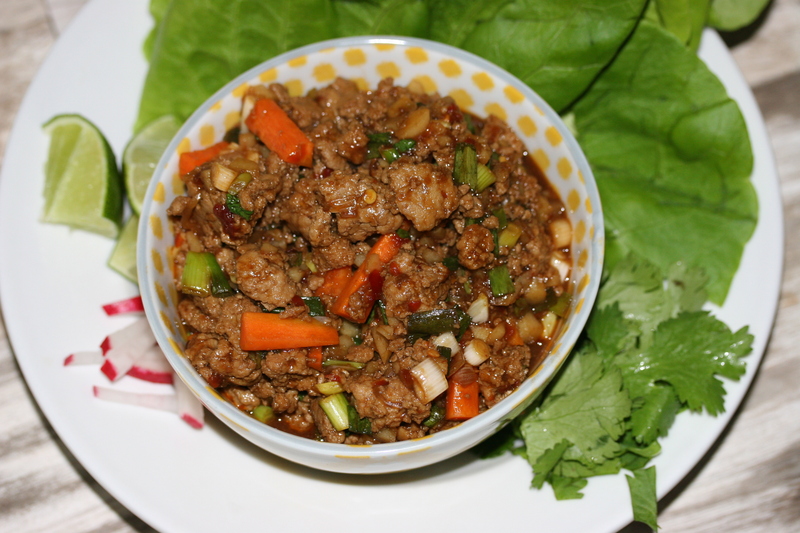 You meats must be cooked, the veggies slightly crisp and fresh, the sauce properly reduced or concentrated and finally noodles cooked but not mushy. 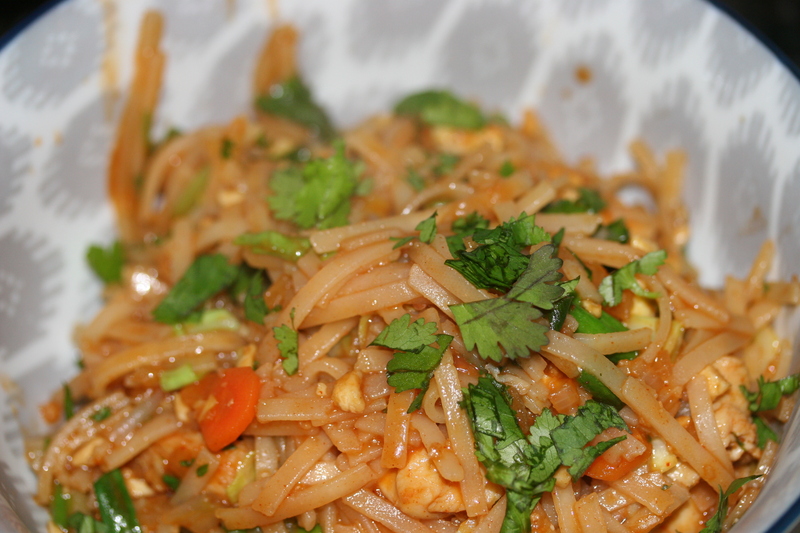 Most of the other Pad Thai dishes on here were made without Tamarind paste because I always have trouble finding it. Luckily Amazon has just about any ingredient I need and they ship it to me so quickly, I find it the best way to get those ingredients that aren’t readily available. 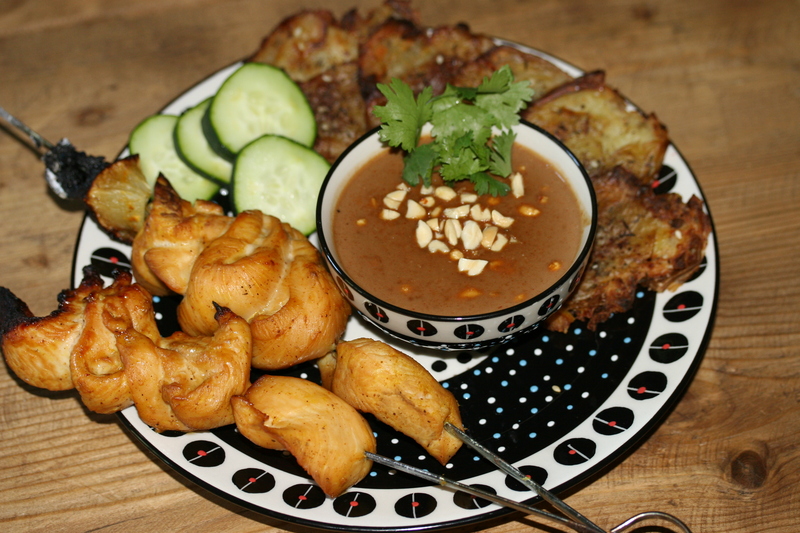 Tamarind is something between tomato paste, Siracha plus a sour or tangy note. After using it, I am sold that is the way to go. All ready ordered some more this morning to keep it on hand. This Pad Thai has a few “different” veggies mixed in primarily due to the fact I had them on hand and didn’t want to waste them. Also my store didn’t have bean sprouts. Sigh… I so wish we had a HEB in the area. I used cabbage, carrots, green onion, shallots, garlic and tomatoes. 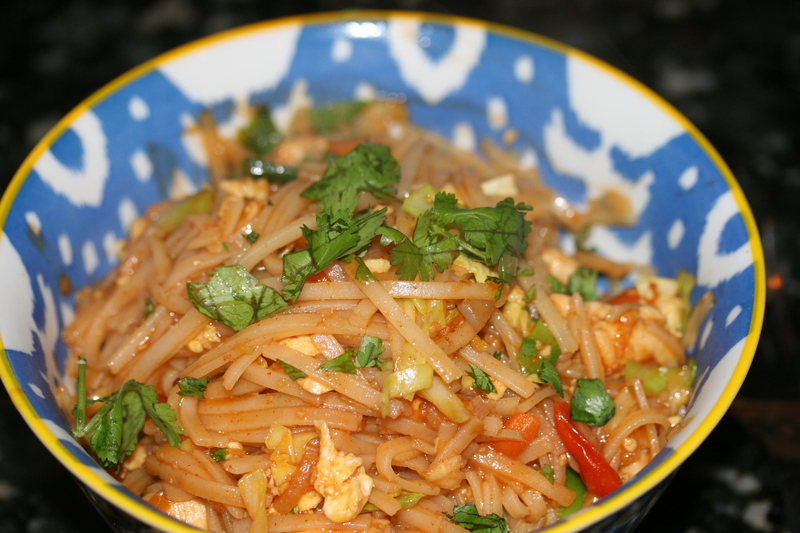 Think of it as a mash up between Pad Thai and a Chinese Stir Fry. It was good and I enjoyed it again for lunch. Before we start, lets go ahead and dice everything up. Your hard veggies like carrots need to cook longer than say cilantro. Set everything aside in the way you plan to cook them. Shallots then cabbage, carrots and large green onion parts, then garlic, green parts of green onion and finish with peanuts and cilantro. 1. 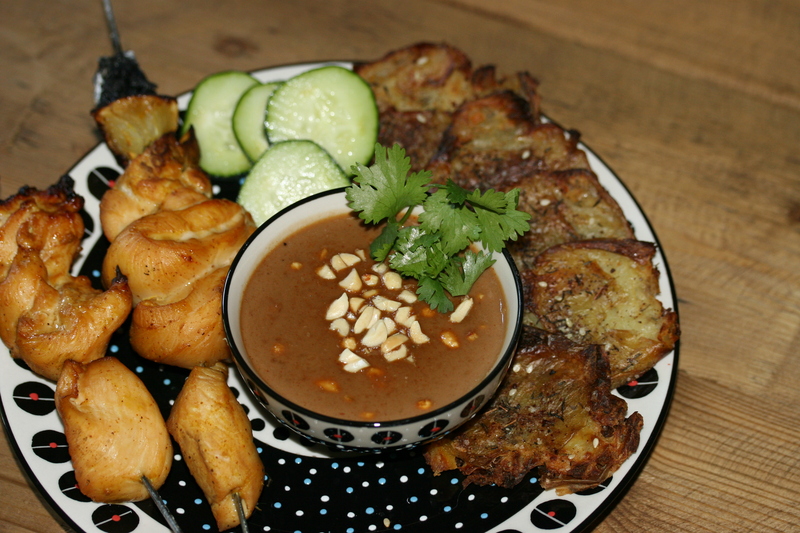 Sauce: In a medium heated sauce pan pour the ingredients in and dissolve the palm sugar. Let this simmer for about 10mins and it will reduce and thicken. 2. Now go ahead and cook your rice noodles by bringing a pot of water to boil, remove from heat and then add the rice noodles and let them soften for about 10mins. (again follow the package). Drain them into colander, and run cool water until they become cool. Set aside. 3. 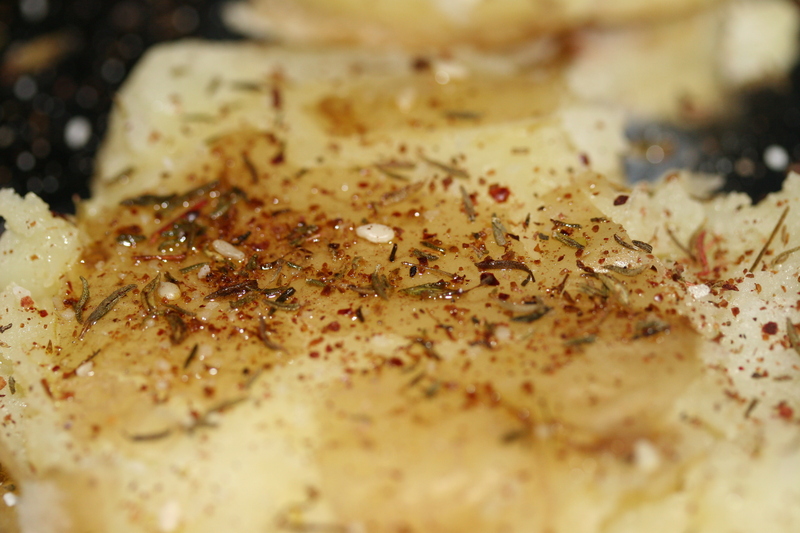 Take your Wok or nonstick pan and turn it to medium heat and cook your chicken. I diced mine and added about 1 tbs of the Pad Thai sauce and cook the chicken through. Remove from heat and set aside. Wipe your Wok. 4. Scramble your egg and set it aside. Wipe your wok again and prepare for the final push. You have your cooked chicken, noodles and egg resting. Now we are going to cook the veggies and combine everything. So add some chili oil into your Wok and add your shallots for about 3-4 minutes. Add your cabbage, carrots and tomatoes. Cook for about 3 more minutes and then add your garilc and green onion (white parts.) Cook for 1-2 minutes. 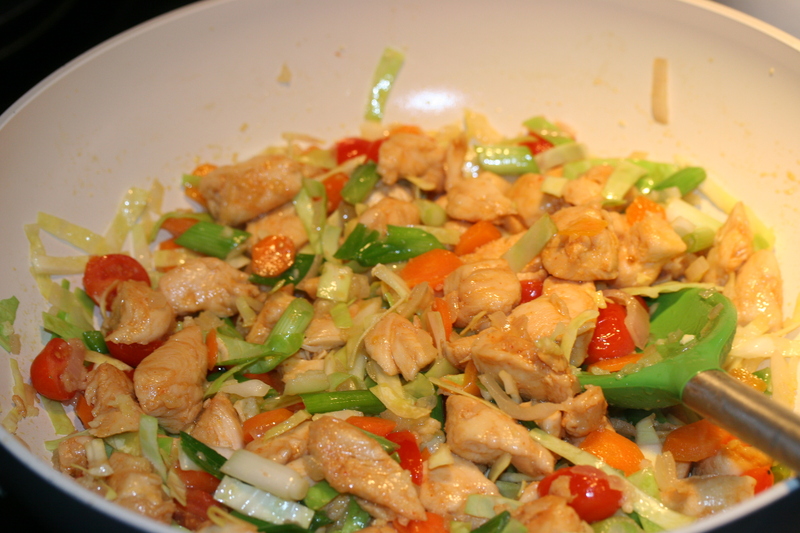 Now add your chicken and the sauce into the pan followed by the noodles. Stir until well coated. 5. Right before plating add your egg and cilantro and half the chopped peanuts. Serve with added peanuts and cilantro.